was a phrase I heard a lot today. Today was a professional development day in our school district. For me, this meant meeting with the teachers at our 9th grade campus and doing some curriculum planning with them in the morning. In the afternoon, this meant meeting back on my home campus for safety and security training. It also meant seeing some colleagues that I don’t see very often. This was confirmed for me by a colleague whose daughter I taught a while back. She said to me as we left our meeting, “I had to look twice, because I didn’t recognize you!” I explained that I’d had bariatric surgery over the summer, and that it’d been 7 months. She asked the requisite question (“how do you feel?”) and I gave my standard answer (“fantastic”). I took the opportunity to teach her a little bit about what I’d had done, and then we parted ways. I’ve had more people tell me that they didn’t recognize who I was today than ever. I still have a hard time believing that I’ve changed that much, but I guess I have. I really believe that the patient is the last one to realize that they don’t look the same anymore because in their mind’s eye, they’re still the fat person they were pre-op. That’s how I see myself, anyway. I still see the 440-pound me in the mirror, and I still move around and negotiate space like her. I still feel like her some days, especially when my back acts up or my knee stiffens. I don’t think I can ever get rid of seeing the fatter me, because it’s an important reminder of where I came from. Most importantly, it’s a great reminder not to go back to where I started. My eating on this day was pretty okay. I was pleasantly surprised to discover that Pei Wei has changed its menu so that now small is a size for entrees, and that you can ask for extra protein. So I did. I ate more calories than usual, but I also worked out today–did a hard 45 minute bike ride on the recumbent bike. I had 1085 calories, 99 grams protein, 67 grams carbs, and 48 grams fat. 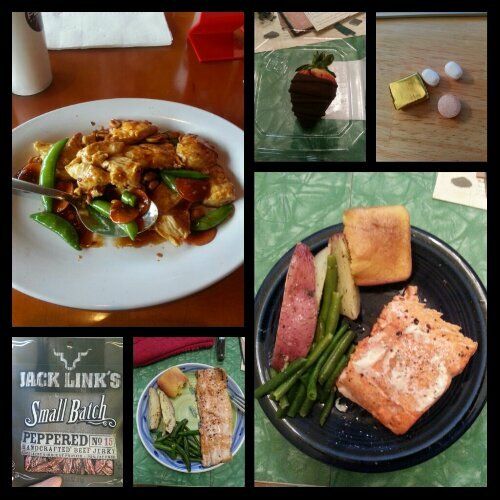 Today’s food choices, from upper right: multivitamin and calcium supplements x2, iron supplement; baked sockeye salmon filet, leftover green beans and garlic dill new potatoes from Boston Market, cornbread half; leftover grilled rainbow trout, cornbread muffin half, green beans and carrots from Cracker Barrel; Jack Link’s beef jerky; steamed Kung Pao chicken (small); small chocolate covered strawberry. Not shown: piece of turkey cutlet. This entry was posted in daily bites, eating, la guerra, little things, oh behave!, post-op, reflections, success, the sleeve, vsg, weight loss surgery and tagged daily bites, eating, exercise, I work out, la guerra, little things, post-op eating, post-op life, reactions to WLS, reflections, self-image, sleeve gastrectomy, success, the sleeve, VSG, vsg realness, weight loss surgery, WLS. Bookmark the permalink. I think it’s hard to see the change like others because you see yourself every day. It’s such a gradual thing that you don’t notice it even though you know it’s happening. I think it can be helpful to remember where you’ve been as long as you don’t let who you’ve been negatively influence how you feel about who you are now. What an awesome feeling though when you get good feedback from people who had the opportunity to truly notice the difference.